Are you looking for the newest giveaway? Check out Nurses Week 2018 Freebies and Giveaway. A few weeks ago I talked about some different ideas for Nurses Week. Nurses end up feeling short changed, as another year goes by when their hours of overtime, staying late, and switching their schedule last minute is merely recognized with a cookie platter delivered to the unit on their day off, and a water bottle with a logo that rubbed off in about a week. Unfortunately I cannot giveaway a car but I do have a list of what I think are some fun nurses week prizes. 5 winners will each receive their choice of a Badge Reel from BadgeBlooms. Lynn Visser is giving away a copy of Fast Facts for the Triage Nurse. This book will not only by signed by Lynn Visser but also by the other two authors. While Lynn Visser was not the main author, she does have a couple of chapters in Fast Facts for the Radiology Nurse. One nurse will win a copy of this book also. I’m also going to sweeten the deal by offering a signed copy of all three of my books. 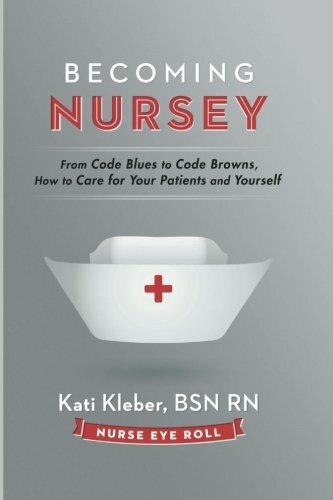 One winner will receive a copy of Becoming Nursey, What’s Next, and Admit One. Developed by a nurse anesthetist, Soothing Scents makes 100% natural and earth-friendly essential oil inhalers to combat PONV and ease patient anxiety – without pills, unwanted side effects, or the need for a doctor’s order. Our flagship product, QueaseEASE, is used in over 1,000 hospitals and clinics across the country, and is a go-to essential for medical professionals who are looking for natural but effective ways to help their patients. 10 sample-size Quick Tabs that can be given to patients and last for up to 72 hours. Don’t forget to enter and share the giveaway with other nurses. I’m celebrating 40 years of nursing this year ???????????? Hi, just wanted to say how much I love your FreshRN sites. I was wondering if anyone can order that Queasy Ease or just the oil or is it just available to Dr.s ect.. Thanks! Yes you can. Just follow the link for Soothing Scents and you can place an order on the site. Awesome sauce! Happy Nurses’ week! Happy Nurses’ Week everyone!! The best decision I’ve ever made in my life was to be of service to others through Nursing! Thanks! Hope I’ll be the lucky winner! These giveaway prizes are amazing! I have one of your books, and I love it! This giveaway also prompted me to try the “Expecting” from Soothing-Scents as I’m very queasy at 14 weeks and expecting my first baby! Happy Nurses Week everyone! Let me know what you think! Hoping to have baby #2 in the next year or so and was REALLY sick with the first one. Was planning on trying it out then myself! “Lots of love coming at you from Soothing Scents during Nurses Week! We are forever inspired and amazed by your compassion and competence. The world is a better place because of what you do and we can’t thank you enough. Happy Nurses Week!! Thanks so much Wendy! WE appreciate YOU and all you do for patients!